The weather has everything to do with squash playing, especially in a country where there is extreme changes in temperature. What has the weather got to do with squash playing? For example, hot days, and cold nights. Let's look at how the ball, as well as the body, behaves under different conditions. The ball is easier to keep warm/hot, therefore the ball bounces higher and rebounds off the wall further. This bounce gives more time to recover the ball and therefore more return options. It may be necessary to hit the high shots a little softer. The body/muscles warm up quicker, and easier, and therefore less prone to injury. Strokes like the lob serve, drop shot and boast will rebound higher on the wall, and in turn bounce further into the court if struck too hard. Adjust, as required. Drink a glass of water before going on the court, and take a few mouthfulls in between games. Wear a headband and/or sweatband to soak up excess perspiration. 6. Take a spare set of playing gear just in case. The ball can feel "dead" unless the rallies are continuous, and the ball is struck hard (at least every couple of hits). This can cause:- ....lob serves to be too low on the front wall. 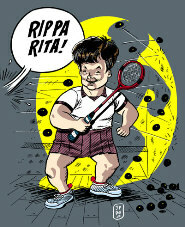 ....drop shots to hit the "tin", as the ball sort of "sticks" on the racket and can feel heavy. ....boasts are harder to get off the back wall as they tend to "die" near the floor; as well as having to be struck with more power. If the ball feels a bit dead during play, it sure will be worse after the break in-between games! Bounce the ball a few times while walking to the service box to serve (but, be careful not to waste time). The body needs longer to warm up and that can affect court movement. Wear a trac suit during the warm-up to keep the heat in. Stretches are a must, as injury is more prevalent when the muscles are cold. Warm up well before going on the court. Keep warm before and after play. This article is very appropriate at this time of year with temperatures varying more than 20 degrees in one day. If you have an opponent who thrashes the ball and keeps it warm, all the better. If not, it might be an idea to keep the rally going a bit longer starting with some hard deep drives, as well as throw in some hard serves. Without heating or aircon our courts in Oz can be like "cold rooms". This happened to me one really frosty night and I could not, for the life of me, drive the ball past the service box which made for an unenjoyable frustrating match. Playing one serve followed by a drop shot sure does not help either.